HWDT’s education programme brings marine science to life, championing our vitally important Hebridean seas and encouraging outdoor and hands-on learning. We operate a multi-stage Hebridean Marine Explorer Programme for primary schools, including school visits, field trips and floating classroom workshops. 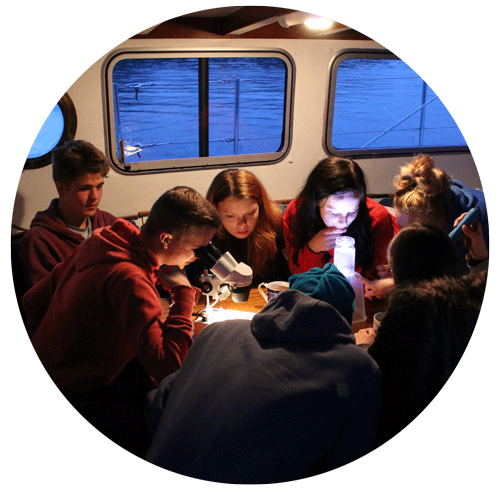 Our programme to “kick start careers in marine conservation” delivers bespoke workshops for High Schools and University groups and provides tailored experiences for young people on board our boat Silurian. Through these activities the Trust provides a rare opportunity for under 18’s to gain residential, offshore work experience in the marine conservation industry. We are dedicated to championing responsible marine wildlife watching in Scotland. 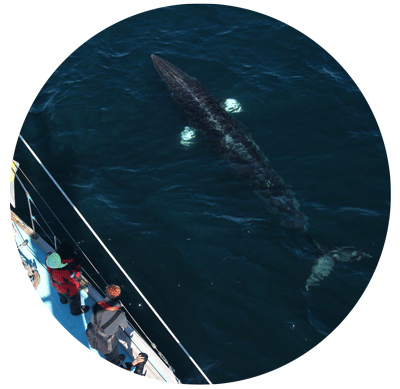 Our team provide training and accreditation for skippers and are active in the development of sustainable whale watching tourism, as the creators of the Hebridean Whale Trail. Contact our engagement team at education@hwdt.org to arrange a school visit. Discover more about the majestic mammals found in our oceans and explore their anatomy with real bones, teeth, baleen and skulls. Reveal the underwater world and explore how our seas can be home to many different whales and dolphins. Jump aboard our floating classroom for a glimpse into the life of a marine scientist and explore our unique whale and dolphin research vessel Silurian. Become a whale-watch master and record your sightings of whales, dolphins and porpoises, helping HWDT to learn more about these amazing animals. A moment to focus on past experiences and explore links between the whales in our waters and our day-to-day lives. Find out what life is really like for a marine scientist, learn how to survey for marine mammals and gain basic sailing experience. A week-long dedicated survey expedition onboard our research vessel Silurian specifically for 16 and 17 year olds. View 2019 dates here. Fully-funded three-day residential trip for groups working with disadvantaged young people aged 15 to 17. Download our Youth Trip Brochure for more information. Whale watching is a growing industry in the Hebrides that supports many local jobs. Working in partnership with local whale-watch businesses, and the WiSe scheme, HWDT trains responsible wildlife watching practices to minimise unintentional disturbance to protected UK wildlife. By encouraging safe and sustainable wildlife watching we can protect our marine species for generations to come. Here at the Hebridean Whale & Dolphin Trust we think the Hebrides are a pretty special place. From dramatic headlands and sea lochs, to white, sandy beaches and bustling harbours, the Hebrides are brimming with special places where land meets sea; where natural and cultural heritage are interwoven. We are currently developing a network of fantastic whale-watching and whale heritage sites across the west coast of Scotland. The Whale Trail will interpret and connect these important sites and work with the community organisations who manage them to showcase the amazing marine wildlife experiences that can be had across the Scottish west coast. This Hebridean Whale Trail will showcase some of the best of the west and tell the stories that make this area so special, and further promote Scotland as one of Europe’s premier whale-watch destinations.